Chapecoense Crash: Plane Ran Out Of Fuel, According To Leaked Audio, Reports : The Two-Way A charter plane crashed near Medellín, Colombia, on Monday night, killing 71 people. According to leaked audio and witness accounts, the pilot cited "fuel problems" and asked for priority landing. Rescue teams work on Tuesday to recover bodies from the wreckage of the LaMia charter plane that crashed in the mountains in Colombia late Monday, killing 71 people, officials say. 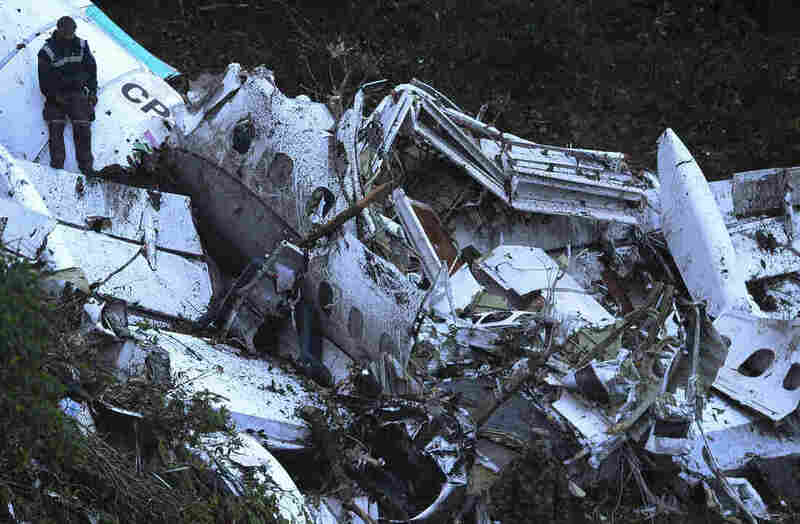 Shortly before a charter jet carrying a Brazilian soccer team crashed in the mountains of Colombia, the pilot told air traffic control he was "out of fuel" and experiencing "total electrical failure," according to leaked audio and accounts from a survivor and another pilot. The plane was supposed to stop for fuel partway through its flight, but it didn't. It requested priority landing in Medellín, Colombia, but didn't declare an emergency, and another plane with mechanical problems was already approaching the runway. So the charter plane, LaMia Airlines 2933, entered a holding pattern — then declared an urgent fuel shortage, and crashed. 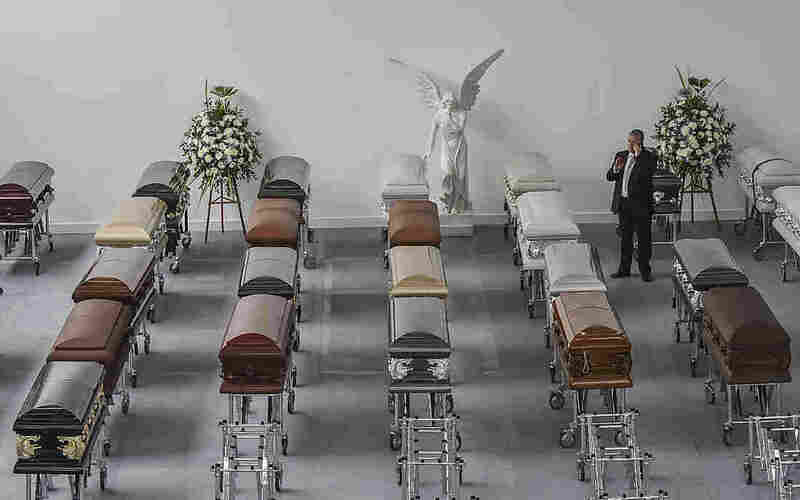 Among the dead were most of the members of Brazil's Chapecoense soccer team, which was having a "fairy-tale" year, as well as a number of journalists traveling with the team. The cause of the crash is still under investigation, but multiple sources describe a pilot panicking about a fuel shortage in the final minutes of the flight. Some coffins for players of the Brazilian football team Chapecoense Real sit at a mortuary in Medellín, Colombia, on Wednesday. Investigators worked Thursday to finish identifying 71 victims of the plane crash as members of the public were left reeling by a harrowing recording of the pilot in the flight's final minutes. The trip didn't go as planned from the start. The charter jet, which specialized in transporting soccer teams, wasn't authorized to pick up the team in Brazil, so the players had to take a commercial flight to Bolivia. That delayed the itinerary, Gustavo Vargas, general director of the charter plane company, told Colombian newspaper El Tiempo. From Santa Cruz, Bolivia, the team boarded the LaMia charter and set off for Medellín. Vargas says there was a planned refueling stop in Cobija, Brazil, but that the delay meant they'd have to refuel in Bogotá, Colombia, instead. It appears the pilot decided not to refuel at all. "We have to investigate the reason he decided to go directly to Medellín," Vargas told the Bolivian newspaper Pagina Siete, noting that the pilot was "very experienced." Without refueling, the itinerary might have been pushing — or past — the plane's fuel limits. From Santa Cruz to Medellín is approximately 3,000 km, or 1,850 miles. LaMia advertised the plane in question, an Avro RJ85, as having a range of 2,965 km (1,842 miles). The actual range would depend on the plane's fuel reserves and payload; Aviation Safety Network says the RJ85 could fly up to 2,343 miles under certain conditions, but just 1,239 miles with a maximum payload. International flight regulations require planes to carry enough fuel to reach their destination and then fly for at least 30 more minutes, Reuters notes. By the time LaMia 2933 reached Medellín, it was reporting low fuel, according to multiple sources, including the flight attendant who survived the crash and a pilot who overheard conversations between LMI 2933 and the control tower. Leaked audio obtained by Colombian media, including Blu Radio, corroborates those accounts. You can hear it in full on Blu Radio's site, or hear portions with translated captions at The Independent. Anonymous sources at José María Córdova International Airport in Medellín also described the situation to the Colombian newspaper El Colombiano. By all accounts, in the final minutes of the flight, the control tower in Medellín had two planes reporting problems. The LaMia charter said it had fuel problems and requested priority landing. But a commercial plane, rerouted because of a fuel leak, had already requested priority. The LaMia pilot did not appear to tell air traffic control he was in an emergency situation. The charter plane was also at a higher altitude than the rerouted commercial flight, El Colombiano reports. So flight controllers decided to allow the flight with the leak to land first. "In the sometimes chaotic exchange with the air traffic tower, the pilot ... requests permission to land because of 'fuel problems' without making a formal distress call. A female controller explained another plane that had been diverted with mechanical problems was already approaching the runway and had priority, instructing the pilot to wait seven minutes. "As the jetliner circled in a holding pattern, the pilot grew more desperate. 'Complete electrical failure, without fuel,' he said in the tense final moments before the plane set off on a four-minute death spiral that ended with it slamming into a mountainside Monday night. "By then the controller had gauged the seriousness of the situation and told the other plane to abandon its approach to make way for the charter jet. It was too late." "Vectors, señorita, vectors to the runway," the pilot said, asking the controller to guide him in for a landing. She told him he was 8 miles away from the runway. "Vectors, vectors!" he said, then went silent. The disaster took eight minutes to unfold, Aviation Herald reports — from when the plane entered its holding pattern to when it disappeared from radar. 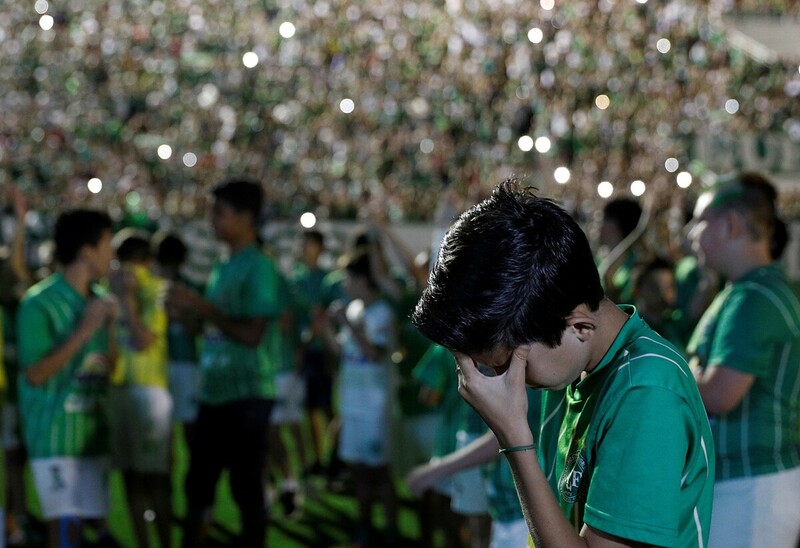 Fans of Chapecoense pay tribute to the players of the Brazilian soccer team on Wednesday. As we reported on Tuesday, the crashed charter plane did not explode or catch on fire on impact, bolstering the theory that it ran completely out of fuel. And Colombian authorities have confirmed there was no evidence of fuel on the plane. But the AP reports that there might be alternate explanations — such as a leak or an intentional fuel dump — for the lack of fuel. On Wednesday night, when the Chapecoense soccer team was supposed to be playing in the Copa Sudamericana, crowds gathered at stadiums in Colombia and Brazil to mourn and pay homage to the dead.